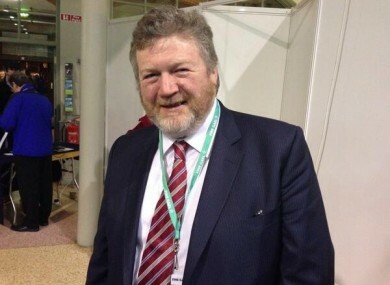 HEALTH MINISTER JAMES Reilly has said that the current system of healthcare in Ireland is unaffordable, warning that continuing with it would lead to tax increases and fewer services. Reilly has sounded the warning as he prepares to publish a white paper on universal health insurance, a system of healthcare provision which both he and Taoiseach Enda Kenny tonight committed to introducing in the next five years. The minister and the Kenny were speaking at the start of the party’s 77th annual Ard Fheis at the RDS in Dublin. Kenny told delegates that UHI would “tear down barriers” to accessing health services, saying the State will either pay for or subsidise families on low-income and pledging that it will be a system where there will be “no outsiders”. Kenny claimed that the number of people sitting on trollies in hospital emergency departments has been lowered by a third or 30,000 fewer patients than when the coalition came to office in 2011. Reilly said the government’s goal is to introduce universal health insurance (UHI) by 2019, insisting it was never the intention to introduce a new system in one term. “We always said that this could not be achieved in one term of government,” he said. He described the current system as “unfair” and “inefficient”. Reilly also hit back at suggestions – including among some in Labour – that the proposals for UHI may not be affordable, warning that the current system cannot continue. “Some have argued that we cannot afford UHI. My answer is simple: we cannot afford the current system, even after all the savings we have made over the last few years,” he said. He said that the UHI white paper will be published in the coming weeks and said it will set out “what a reformed healthcare system will look like, and how we will get there”. Email “Reilly: Some say we can't afford UHI - but we can't afford the current system”. Feedback on “Reilly: Some say we can't afford UHI - but we can't afford the current system”.